The Nashoba Valley Public Policy Committee is dedicated to influencing the development of local, state and federal laws and policies in support of the Chamber’s mission. The Committee advocates for public policies that promote job growth, business expansion and new market opportunities, while opposing government actions that would have the opposite effect. The Committee also serves as a resource to the membership, providing information on important issues, opportunities to advocate on their own behalf, and direct contact with elected officials, candidates for public office and policymakers. Upcoming Public Policy Meetings You'll not want to miss these meetings! Mark Your Calendar Exercise your right to vote! Is the opioid epidemic impacting you and your workplace? Find out what's being done to curb abuse and reduce overdoses on Tuesday, Dec. 1, at the next Public Policy Committee meeting. We welcome Senator Jennifer Flanagan and Elizabeth Mahoney, policy advisor to Gov. Charlie Baker. What's happening on Beacon Hill? Apparently not a lot, but is the "snail's pace" a bad thing? The Chamber has taken positions supporting the reduction of the limited-liability company filing fee and opposing onerous legislation that would create a costly nightmare for employers when scheduling employees. In addition, the Chamber applauds Governor Baker, Senator Jennifer Flanagan and Representative Jennifer Benson for their work on approving critical funding in the FY16 state budget for communities that host correctional facilities, including the Town of Shirley, which face an unfair burden on municipal services. The Chamber recently held their 3rd Annual Beacon Hill Day at the State House in Boston. A dozen members of the Chamber made the trek to the State House to advocate on behalf of the Chamber and the Nashoba Valley. During the day long program, members were able to meet with the Representatives and Senators from our region. In these private meetings, members were able to advocate for reducing the burden on small business including the LLC filing fee, additional local aid to Shirley for prison mitigation and better transportation access to and from the Region. Following the morning of meetings, the Chamber members held a working lunch with three key staffers from the Baker administration. Nam Pham, Assistant Secretary for Housing and Economic Development, delivered an overview of plans for job creation and tools and services available for assisting. Elizabeth Mahoney, the Governor’s Policy Director, provided an overview of the Governor’s plans relative to opiate abuse, education, reforms at the MBTA and regulatory relief. Rob Garrity, Chief of Staff for the Massachusetts Department of Transportation, provided a strong view of transportation’s importance for economic development and is enthusiastic about a reverse commute to our region via commuter rail. 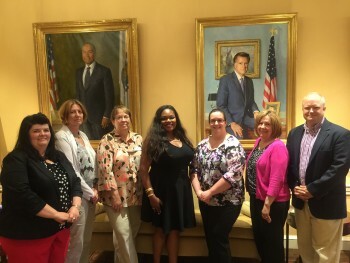 Following the lunch session, members were afforded the opportunity of a private tour of the Governor’s office. This “backstage” tour provided some great photo ops of the Council Chamber, the Corner office and the chance to meet members of the Governor’s Senior staff. We encourage you to attend our 4th annual day on the Hill next June. Our voice is being heard on Beacon Hill.